In most New York places, space is hard to come by. 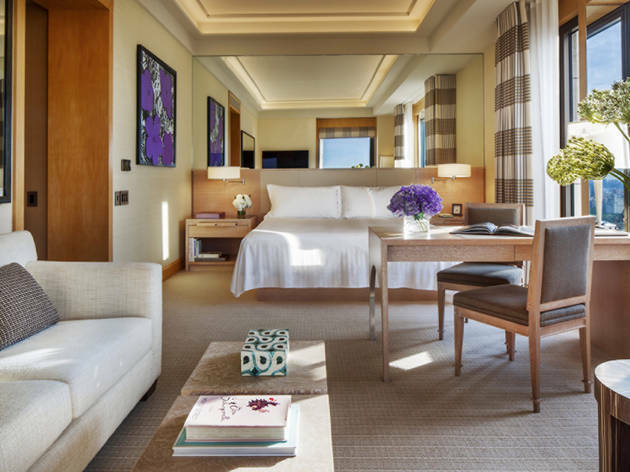 So it’s easy to see how the sprawling rooms and high ceilings can be added to the long list of amenities at the Four Seasons Hotel New York. Hike the palatial marble-floored path through the lobby, past the concierge counter to the check-in desk. There, before giving you your room key, an accommodating staff member asks if you prefer a complimentary New York Times, Wall Street Journal or New York Post to wait outside your guest-room door in the morning—if you’re not sure, you’re welcome to select all three. Take the elevator down to the spa level to enjoy the complementary steam room and fitness center, which is stocked with both chilled and room-temperature bottles of water, fruit and sports drinks, all freely available. With short notice, the spa is able to reserve guests a personal trainer for the fitness center, hair stylists and makeup artists, and massage appointments. Keep riding the serenity wave up into the contoured deep soaking tub in your guest room while watching your favorite program on the in-bathroom flat screen TV. Or, enjoy the Bvlgari toiletries in the glass-enclosed shower. 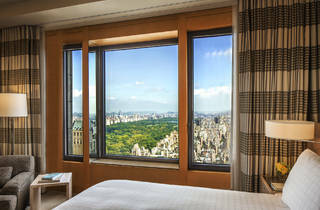 Afterward, slip into your plush robe, press a button on the blonde wood wall paneling to open the drapes, and take in the panoramic city views that either highlight the grand skyscrapers of Midtown or the iconic green respite of Central Park. Back on the ground floor, enjoy Four Seasons Hotel New York's dining facilities: For breakfast, brunch and lunch, visit the Garden, and indulge on cloudlike lemon ricotta pancakes, served with a personal-size bottle of Crown maple syrup ($34). For all the post-lunch sustenance you’ll need, walk across the marble-columned lobby and ascend a half-flight of stairs to Ty Bar, which serves sophisticated “bites” like spicy ahi tuna ($24) and Korean beef tacos ($30). But the real stars of TY Bar are its complex cocktails, like the signature NY de Fleur ($24), which mixes Ketel One vodka with St-Germain, lemon juice and champagne over an ice globe containing an edible flower. After a few cocktails, retire to your room, put your clothes in the walk-in closet, and climb into your firm bed covered in soft linens. 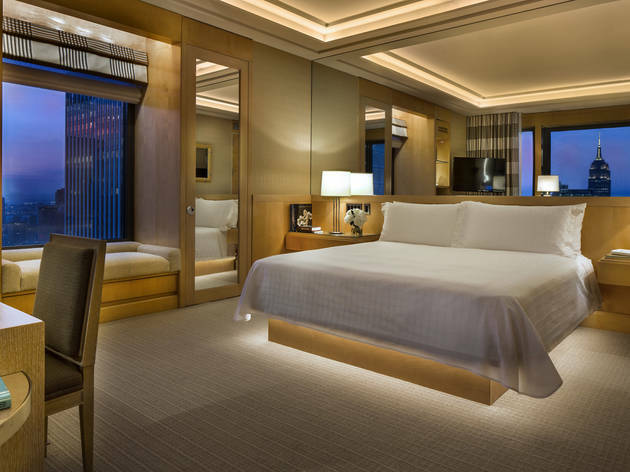 To ease your anguish about impending check-out, call the operator from your in-room phone to inquire about purchasing your own exclusive Four Seasons bed. 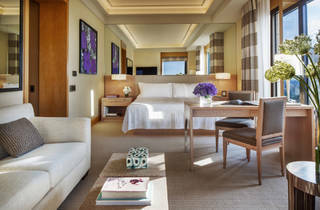 TIME OUT TIP: Four Seasons Hotel New York’s location in Midtown East is prime window-shopping territory for the city's most opulent garments, gems and accessories. Stroll through nearby Fifth Avenue institutions like Henri Bendel, Tiffany & Co. and Bergdorf Goodman. And during the holiday season, enjoy the stores’ festive window displays. 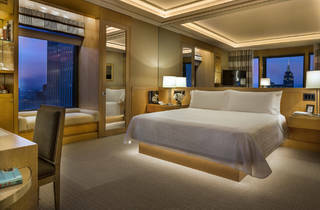 Experience five-star New York hotel living in this modern-deco landmark designed by famed architect I.M Pei. 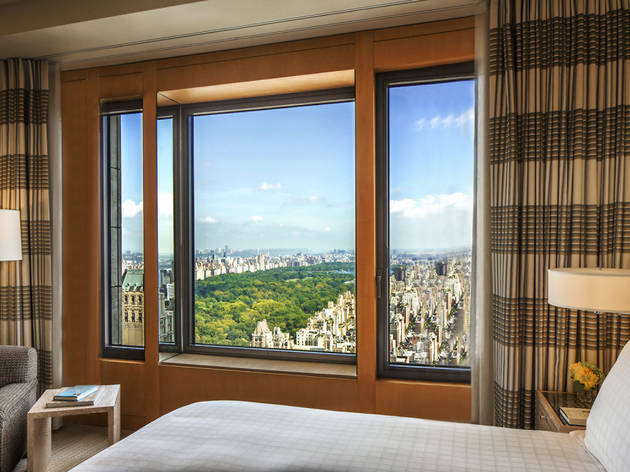 Infused with natural light & panoramic views, Four Seasons will provide you with serenity & luxury high above Manhattan’s exhilarating whirlwind.